Class wise , Subject wise , Medium wise Learning Outcomes Posters, Brochures. 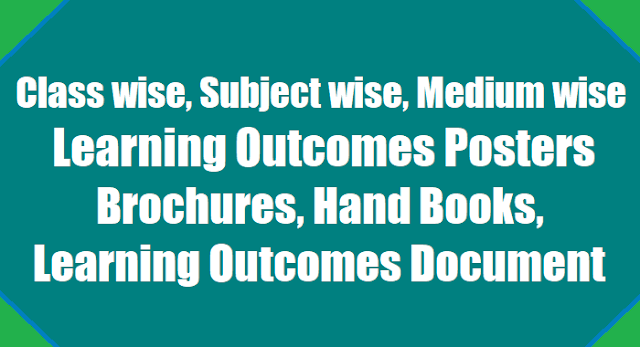 Instructions on Learning Outcomes Posters, Brochures, Learning Outcomes Document, Learning Outcomes Booklet. Guidelines for distribution of posters and broachers to schools: C and DSE Telangana - Rc.No.941, dt.25.10.2017 :: Sub: SCERT, Telangana Hyderabad - Printing and Distribution of Learning Outcomes, posters and brochures to all the Primary, Upper Primary and High Schools under Government and Govt. Aided managements pertaining to minor media - Orders issued. 2) Letter to Director, Government Text Book Press for printing of posters and broachers on learning outcomes from Classes I to VIII, dated:lS.09.2017. 3) Govt. Memo N0.2228/SE/Prog.-1/2017, dated:28.08.2017. All the RJDSEs and DEOs are hereby informed that, vide subject and reference 1st cited, the class wise and subject wise Learning Outcomes, posters and broachers have been prepared and printed and distributed to all the DEOs with instructions to supply to all schools through MEOs before 22.10.2017 and also conduct parents meting and discuss the Learning Outcomes and distribute the brochures to them. Now the Posters and Brochures for minor media schools i.e., Urdu, Hindi, Kannada, Tamil, Marathi and Bengali have been developed, printed and now ready for distributions to the districts. The National Achievement Survey will be based on the learning outcomes which are class and subject specific. Following are the guidelines for the distribution of posters and broachers to all the schools of minor media through ME Os. • The posters i.e. subject wise and class wise have been printed and ready for distribution. The posters shall be displayed in the class room i.e. the number posters to be displayed in class - 1 is 3 i.e. Mother Tonuge, English and Maths. Depending upon number of subject per class, the posters need to be displayed i.e. class VIII requires 7 posters to be displayed i.e. Mother Tongue English, Second Language (Telugu), Maths, Phy. Science, Bio-science and Social studies. Brochures are @ l per class i.e. each brochure will have learning outcomes of all the subjects of that particular class. Broachers shall be given to the children based on their medium i.e. Urdu medium Brochures to the students studying in the Urdu medium schools / sections and like all other media. The brochures are meant for parents. The Headmasters shall be directed to conduct parents meeting on 30th or 31st October 2017 and discuss the learning outcomes and distribute the broachers to them. The printers will supply posters and brochures to the districts of Hyderabad and Ranga Reddy and the DEOs of remaining 29 districts are requested to send a person to collect the posters and brochures pertaining to the various media as per the medium-wise number of posters and brochures is enclosed. The expenditure for the travel and transport may be met from the Management Cost of SSA funds for the year 2017 - 18 available with DEOs. The DEOs to instruct the person going to received posters and brochures to count and receive the posters and brochures from the printers based on number of posters and brochures attached herewith. Instructions may be given to the MEOs to come with list of schools i.e. Primary, Upper Primary, High Schools including all the types of residential schools and aided schools under Government managements with class wise number of children pertaining to minor media. Based on the list from the MEOs and also cross check with DISE data on the posters and broachers need to be distributed to the MEOs with instructions to provide the same to all the Headmasters from Mandal point. The transport charges for the MEOs from District to Mandal shall be from the SSA funds of that particular district. The Headmasters shall meet the transport charges from Mandal to School Point from the available schools grants of SSA. The DEOs shall maintain the acknowledgement of number of posters and brochures received by MEOs and the MEOs shall maintain the acknowledgement of number of posters and broachers received by Headmasters. The district wise number of schools i.e. medium wise have been enclosed along with district wise number of posters and brochures i.e. class wise, subject wise i.e. Class I to V minor media and Class VI to VIII minor media. All the District Educational Officers are directed to take immediate action and make necessary arrangements to receive the posters and brochures pertaining to minor media of Urdu, Hindi, Kannada, Tamil, Marathi and Bengali and distribute to the schools through MEOs. 1) Nava Telangana Printers Private Limited, M H Bhavan, Azamabad, Near RTC Kalyana Mandapam, Bagh Lingampally, Hyderabad - 500 020. The printer will provide all Posters from Class I to VIII and brochures for classes : VI to VIII. The DEOs are directed to furnish the receipt and distribution of posters and brochures pertaining to Telugu and English medium vide reference cited and also pertaining to all minor media before 2nd November, 2017 to the Director, SCERT, Telangana positively. The Director, Govt. Textbook Press is requested to make arrangements for the supply of Posters and brochures pertaining to minor media to the DEOs of Hyderabad and Ranga Reddy and arrangements for the distribution of posters and brochures to the sectoral officer deputed by DE Os of remaining 29 districts.